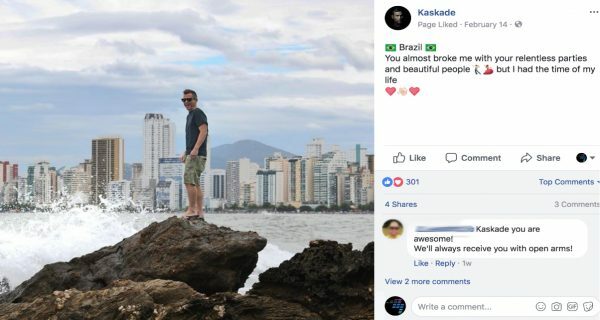 Kaskade is one DJ/producer who takes social media seriously. Follow the guidelines below to ramp up your Facebook content and give your page that professional sheen. 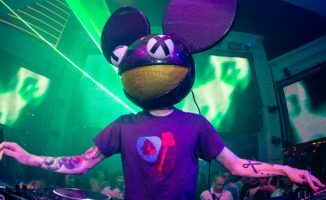 The first segment of this Zero To Hero series laid crucial foundations that influence your DJ/producer success. In part one you learned to support your craft with creative micro income streams that pay the bills. Part two showed how to rise above the online noise by creating killer content. For part three, you defined and developed your DJ/producer brand. Today’s article is all about making your Facebook Page a success. What should a professional page look like? How do you get that seemingly elusive growth and engagement? And is there anyone actually doing this right? Read on as we go through building a page that’s sharp and keeps fans coming back for more. Building upon the aesthetic you’ve created, make a Facebook page separate from your personal account, as this marks a line in the sand between private and professional life on the platform. After you’ve generated your official page, complete every relevant field: that means filling in the “About” section with your bio, story, links to your website and other platforms. Leave nothing blank – a good profile is a complete one. Add a clean looking profile image and cover photo that scream your aesthetic. Build tabs along the side, including sections that are important to your brand (Mixcloud, Store, Reviews, etc) to make it easier for your audience to click around everything you offer. Ensure you’re using the proper image sizes for the platform; to avoid memorising boring dimensions you can find an always up-to-date resource here. Once you feel everything is on point, invite all your friends and family. Every single person. Don’t feel discouraged by the small fanbase you grow at the beginning, it’ll get better with time. Key to your page’s success is posting a little of your stuff, a little of other people’s stuff, and then connecting with your audience about that stuff. This is your Facebook “Rule Of Thirds”: promote, share, engage. A quick way to bore your fans is to exclusively post content about you. Before you share anything though, ask yourself: “Will this entertain them? Will they even care? What do I like to read from DJs I follow?” (We’ve got a few DJs you should check out later on.) Give your current followers something worth sharing, and reduce friction wherever possible to make passing that content along extremely easy. Always include a visual aspect to your posts, and keep them bite-sized. Be authentic. Be consistent. No matter what, give your audience a “value first” approach and you can’t go too far wrong. A mixture of videos, pictures, articles, links, and audio is the formula, but what exactly falls under each third? You’ve already created tons of content during part two, so here’s where you can publicly put that to use. For all the other stuff that’ll round out your page, “document don’t create” as entrepreneur Gary Vaynerchuk says. Do this on a daily basis and you’ll have a whole catalogue of material to use. First and foremost people want to see you, that’s why they like your page. Keep them up to date. This means gig announcements, pictures (behind the scenes, throwbacks, studio shots, hanging with other DJs), short vlogs, Spotify playlists you curate, DJ mixes, livestreams, new tracks, you name it. 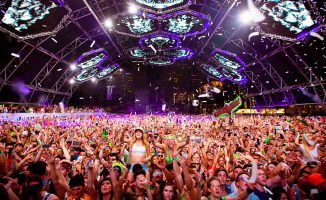 If it’s DJ or production-related and you find it interesting, chances are your fans will too. If you see a cool event in your area that you think they’d check out, share it. 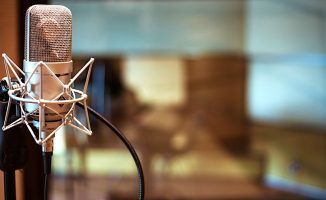 Interviews or mixes from DJs you admire, podcasts you enjoy – share them. 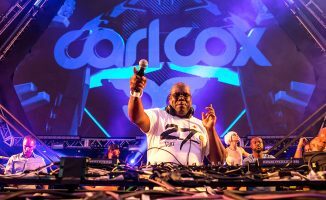 Tracks you dig and insightful articles from Digital DJ Tips? Go ahead, post those too. Having a two-way conversation is the only authentic way to build your tribe. The biggest value for people on Facebook is entertainment and the promise of interaction: Ask questions; encourage people to share; answer everything. Most of all be friendly and approachable. To expand your network, join other relevant Facebook groups and help out. Interact on music pages as your DJ persona. If you’re polite and helpful, people will be intrigued and click through. You might be thinking “Wow that’s a lot of stuff! How could I possibly do all that and still have time to eat, sleep and DJ/produce?” For the promote and share portions, the trick is having a dedicated, organised area filled with material you can share. A folder or Google Drive with images, videos, article links, quotes and so on will do. This way you can pull from it when needed. You’ll want to figure out your posting goal, too: Two posts a day? Five? We generally recommend between one and three, though whatever you choose, make a plan and stick to it. Schedule your posts ahead of time, whether through Facebook or a third party app like Sprout Social. Experiment with posting at different times to figure out what gets the most eyeballs, but also pay attention to your demographic and when they’re most likely to be online. Generally the afternoons/evenings in their time zone works out great. Download the app if you haven’t yet, it’ll make checking things have posted correctly and connecting with your fans that much easier. Occasionally spend some change boosting posts and running ads to reach a bigger set of people. Once they’re on your page and see all the awesome stuff you post, they’ll become fans. An example of connecting with your audience using the Rule Of Thirds in a single post: Promoting your livestream, sharing music from other people, and engaging by asking for suggestions. Emulate this regularly and you’ll be on a path to success. Six-times world champion. Club and festival DJ. 60,000 Facebook fans. Click on his page to see a classy black and white aesthetic across his profile and cover photos, with the latter featuring him rocking a crowd. The tabs along his page feature all the usuals plus “Mixes & Downloads” and “Instagram” which populates his feed from that platform. DJ Rafik posts consistently and mixes it up with throwback pics, photos with other DJs, and free track giveaways. 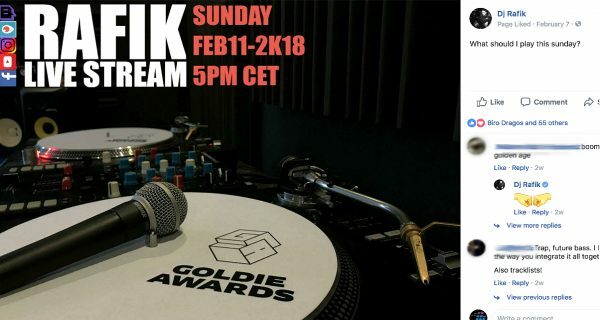 He hosts regular Sunday performance livestreams, followed by a “tracklist” post giving his audience the inside scoop. He gets tons of reactions, comments, and shares, but most importantly he replies to every single thing. A DJ/producer and the 2016 DMC Online World champ with 82,000 fans and counting, DJ Brace maximises the real estate on his page like a total pro. The cover photo features his 2018 world tour dates, and being a performer, videos are front and center. 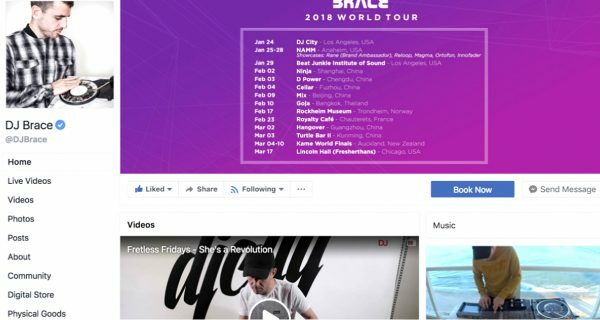 In addition to doing everything mentioned prior, Brace features travel updates, shares videos from other DJs, and has created a series called “Fretless Fridays” that gets serious views. 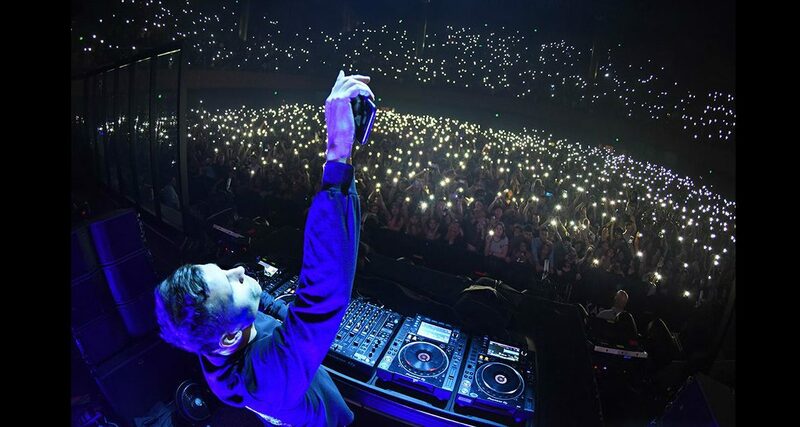 Voted America’s Best DJ in 2011, it’s no surprise Kaskade has nearly 2 million Facebook fans… if only it were that easy. While you might not have that many to start, there are things to glean from his page. Instead of a photo, he has a cover video showing footage of him performing. His aesthetic (read: brand) is consistently on point. In terms of content, he posts the usual suspects alongside non-DJing clips, hashtags, and funny content. Do you think those 2 million fans would stick around if his page was a boring mess? Nope! Now you have four ways to maximise your Facebook page to grow an engaged, loyal following. Get implementing and stay tuned for part five, which shows you how to navigate (and dominate) Instagram for DJ/producer success. What kind of content do you post on your Facebook page? What would you like to post more of? Share your thoughts below!